If we couldn't see all of Florence in four months then how could we have expected to see all of Rome in two months? If we did think that, it was because on arrival we thought there wouldn't really be too much new to see, since we'd spent a week in Rome in 1981 and thought we'd covered it pretty well. But things, or we, or Gerry have changed: What we want to see always expands to fill the time available. If in 1981 we acted like the typical tourist and rushed around to see the major sights — we climbed to the top of St Peter's and were in the Pantheon — it was because we had only that week. On our return we wanted to see much more. 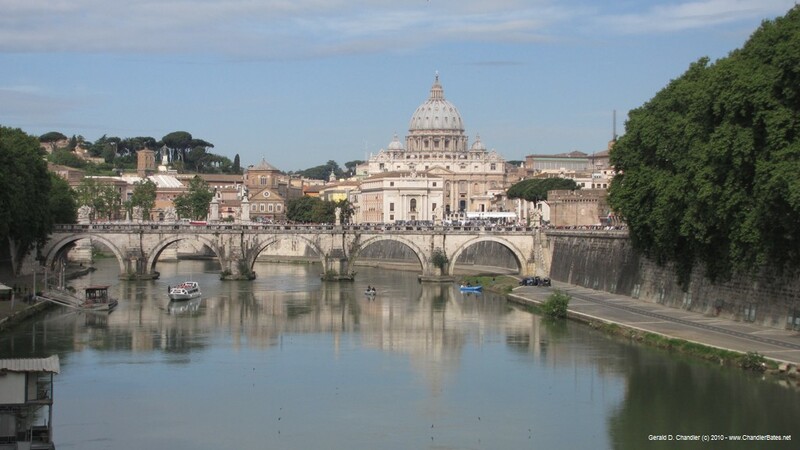 The first part of our Roman stay is covered in our Frontpage for May 28; here's a bit more: "One if by sea, two if by land" didn't exactly apply to our arrival in Rome. It was by land, but by a type of transportation that Paul Revere never envisaged: the iron horse, or the train. On April 29 we moved household, as much as we have a household, from our our apartment in Florence to the main Florence station, Santa Maria Novella, and then by Trenitalia to the main Rome station, Termini. There after some haggling with the taxi dispatcher we got ourselves to our new digs in Adige street, about 3 km of NE of Termini. It only took a few hours to get settled in: the same afternoon we were off to the closest supermarket we could find (turned out there was another, closer) and stocked the cupboard. The next day we started our explorations of Rome by attending the beatification mass of John Paul II. (Unfortunately we were part of the vast crowd that not only couldn't get into St Peter's Square but that couldn't even get close enough to see the giant TV screens that relayed the event. What followed would be nine weeks; all but one of them gone now. And a series of visits that simultaneously fade from the mind and form mixed and confused memories: was it this or that Baroque church that we liked so much? Which museum was best? Where did we see that statue? And what about all of those ruins? How can one tell others about them? Rome's Top 10: Vatican City (1), Pantheon (2), Roman Forum (3), Galleria Borghese (4), Colosseum & Imperial Fora (5), Musei Capitolini (6), Museo Nazionale Romano (7), Santa Maria del Popolo (8), San Clemente (9), Ostia Antica (10), Our visit. Ancient Sites: Roman Forum (3), Pantheon (2), Imperial Fora, Colosseum (5), Ostia Antica (10), Our visit. Palatine Hill, Baths of Diocletian, Column of Marcus Aurelius, Nero's Golden House (Domus Aurea), Largo di Torre Argentina, Theatre of Marcellus,[ Crypta Balbi, Appian Way]. Museums and Galleries: Vatican Museum (1), Museo Nazional Romano (Diocletian, Massimo, Altemps, Balbi) (7), Galleria Borghese (4), Musei Capitolini (6), Galleria Nazionale d'Arte Antica ( Barberini, Corsini) || Villa Giulia, Galleria Doria Pamphilj, Palazzo and Galleria Spada, Galleria Nazionale d'Arte Moderna, Galleria Comunale d'Arte Moderna,. Churches: St Peter's Basilica (1), Santa Maria del Popolo (8), San Clemente (9) || Santa Maria Maggiore, San Giovanni in Laterano, Santa Maria in Trastevere, San Luigi dei Francesi, San Paolo fuori le Mura, Sant'Andrea della Valle,. Squares and Fountains: Piazza Navona, Trevi Fountain, Campo de' Fiori, Piazza del Popolo, Piazza San Pietro, Fontana delle Tartarughe, Piazza Barberini, Piazza Venezia, Fountain of the Naiads, Piazza Santa Maria in Trastevere,. Villas and Palaces: Villa Farnesina, Campidoglio Palazzi, Palazzo Borghese, Palazzo Massimo alle Colonne, Palazzo Farnese, Villia Giulia, Palazzo Barberini, Palazzo della Cancelleria, Palazzo Spada, Palazzo Venezia. Vistas: Roman Forum from Campidoglio, Il Vittoriano, Gianicolo, Spanish Steps, Musei Capitolini Cafe, St Peters Dome (1981! ), Knights of Malta Keyhole, Castel Sant'Angelo Ramparts, Pincio, Villa Mellini. Underground Sights: San Clemente, Catacombs, Vatican Grottoes, Nero's Golden House, Mamertine Prison, Crypta Balbi, Casa di SS Giovanni e Paolo, Museum Barracco, Pompey's Theatre, Mithraeum under San Stefano Rotodono. We don't rank the sights in exactly the same order as Eyewitness 10 Ten, but it is not worth arguing about: everybody has their own opinion. In fact, close inspection of the lists shows some inconsistency between them, indicating several editors were involved in creating them. For example, Pantheon is ranked before Roman Forums in the Top 10 list but the inverse in true in the Ancient Sites list. The listed squares and fountains don't individually rate in the top 10 but we saw them often. Many of the main buses from apartment into city-center passed through Piazza Barberini so we did too. In fact, we often changed buses there and had time to contemplate the two Bernini fountains there. During May we weren't in or near Piazza Venetia but in June we were there often; in the last week almost every day. It gives access to Il Vittoriano, the Forums, and several museums.